I have a few but the one that clearly stands out is my experience at the 2009 FISU Games. The atmosphere, the village, all the different athletes living together and mingling with one another made this event a very special one. Thanks to sport, I got to meet other elite athletes that I would otherwise never have had a chance to meet. I also had the privilege to celebrate Canada Day at the Canadian Ambassadors personal residence along with the whole Canadian Delegation. The Celebration was to die to for, with amazing food and even more amazing people everywhere. Just an experience I will never ever forget! The CAN Fund and all of its sponsors helps me focus on my training 110% and go after my Olympic dream without the financial distractions that we athletes have to face. Member of the Hamilton Sr Mens Gold medal team at 2007 National Championships. Most Valuable Goalie, 2006 Commerce International Tournament. Most Valuable Goalie, 2005 Cadet Nationals when we finished 11th. I have two rituals that I absolutely have to do before every game. 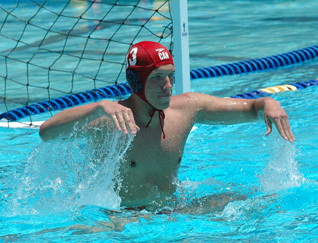 First I have to touch the cross bar with both hands in the middle of the net and then be on the side closest to the bench before the swim-ball. I absolutely hate swimming yet I’m always in the water, weird how that works out! As well as loving to play waterpolo, I enjoy playing tennis, the only land sport that I haven’t injured myself at so far. Don’t ask about other broken bones. I’ve broken quite a few of them, I am an athlete after all.